Enter this tweet from Emily - "Target has the Easter stuff out. It's very...pastel. " 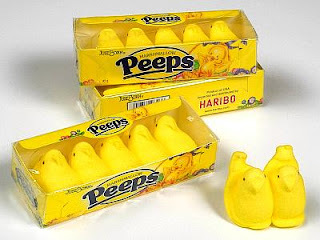 Yep...Easter candy. 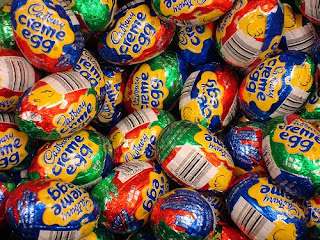 The best candy of the whole year. It beats out Christmas and Halloween by a long shot. When else can you get chocolate filled with creamy yummy sugar made to look like an egg. I mean how do they do that. It has a yolk. I mean really. What could be better? Maybe this version. 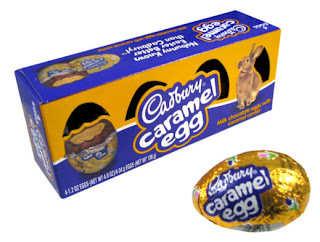 No fun yolk, but it's an egg filled with caramel. Chocolate...good. Caramel....good. What's not to like. 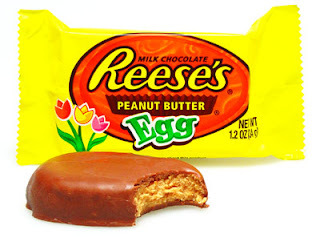 Then there's the classic Reese's Egg. Kind of like a Reese's cup but way better. Its so thick of the wonderful sugary peanut butter. Too good to pass up. And you can't forget about the fruity candy too. 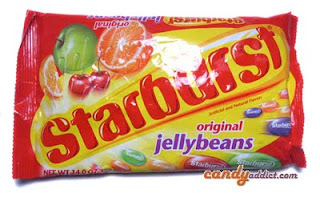 What's Easter without jelly beans and what better jelly beans are there than Starburst? Good thing too because I was starting to get a sugar rush. I guess I better go pop my Jillian Michaels video in because I already consumed enough jelly beans today to make it so I can't have dinner unless I burn some calories. My friend Emily over at chattingathesky.com encourages her readers to stop every Tuesday and to unwrap the little moments we have in our life, to really stop and think about the things that we are blessed with. I've written posts before but have been in a slump recently. Today I couldn't help but think about Ryan's Grandma. She's the one who turned 90 in October. Well, she has taken a turn that we just don't think she will recover from. The doctors are saying that there is nothing else they can do and that her heart is just giving out. They are saying that she has a couple months left at most. We actually thought we were going to lose her last week but she seems to be pulling out of immediate danger. So now we have been given a gift. A gift of being able to say goodbye. We can enjoy these last few months. We can visit her and just spend time with her. Thankfully she is still fairly lucid, although she does have moments that make you scratch your head. I was not given this gift with my grand parents. My grandfather died before I was born. My grandmother died when I was preschool age. I remember her but saying goodbye wasn't an issue. My other grandfather died when I was in 3rd grade. I was really too young to know what was going on. My other grandmother (GiGi) died when I was newly married. When she was dying, I chose not to go say goodbye. I have to say that this is one of those regrets in my life. I know she knew that I loved her. I know that she was much less lucid and probably wouldn't have even known me, but I really have feelings of regret over this. So now I feel like I have been given a second chance. Ryan's grandmother has been my grandmother for over 10 years. She has treated me like her own. And now I have been given the gift that I thought I lost with GiGi. In a way, I feel like I am saying goodbye to both of them. So during this season of life, I am unwrapping the gift of time and second chances. 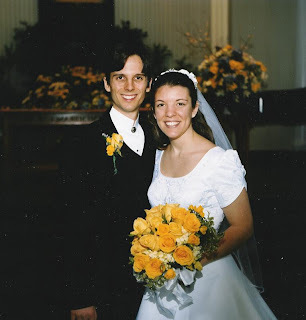 10 Years ago today I married the most wonderful man in the world. We were young and innocent. We had great dreams. We were a tad naive in some of those dreams. I mean who retires at 30 and I am definitely not cut out to own a farm. But we are so much more than we ever imagined at 22 and 24. 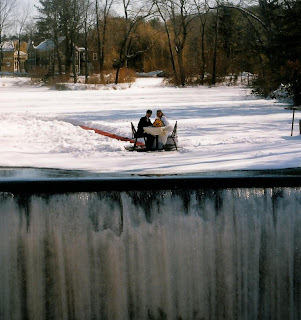 We have been through our share of things from unemployment to moving to a different state twice. We have weathered times of job difficulties. And we have experienced some wonderful things like buying 2 houses and having the cutest baby in the world. So today we are celebrating a life together, both in the past and the future. We can look back with great nostalgia and can look forward with great expectations. I know the road ahead will bring with it more joys and more heartbreak. But we will do it together. And that's just awesome. I couldn't ask for more. I have started using myfitnesspal.com to track calories and exercise. I really like it. It's a website but it also has an app for my iPhone. There is even that fancy new badge on the right side of my blog. During my trip to FL I was able to run on the treadmill each full day that I was there. I did do pretty well with my food but allowed myself the treat of some Kahlua Cheesecake at the Cheesecake Factory. Oh and it was soooo worth it. The results are that I have lost 8 pounds in a month. I am very proud of that. I have 4.5 weeks to go until my cruise. I have a goal of 4 more pounds to go before then but am hoping to exceed that. I have 6 more pounds to go before I am at my pre-pregnancy weight. And I have 12 more pounds to go to get to my goal. I think all of those things are doable. One of the things I have learned over my weight ups and downs is that it is possible to set far reaching goals that are attainable but it is always better to set goals that are maintainable. So that is where I am. Thanks for the accountability. Yesterday was a great day to be outside in the snow. Ainsley didn't think so though. She doesn't like the snow. So we came inside and played. Here's a video of her in the snow and then inside. Where do you think she's happier?